I've been working on some new recycled yarns for my etsy shop. 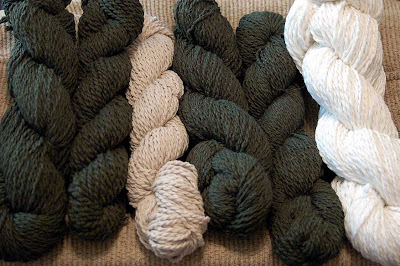 These are yarns that I took apart from sweaters, then re-spun into a heavier weight with twist so that they are easy to knit up and don't snag like most recycled yarn will. I'm also trying to offer more of a variety of fibers in my shop, so these yarns fit right in. This is a sweater I started with some of the recycled yarn. I'm also working on a baby sweater with the yarn as well, but I'll wait to post it until it is delivered to the recipient. 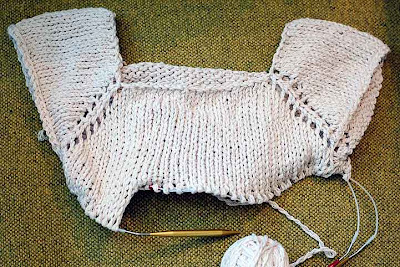 It knits up really nicely, and it is slready pre-shrunk so I don't need to worry about it changing shape on me. Bo also says hi. He thinks he's so special. 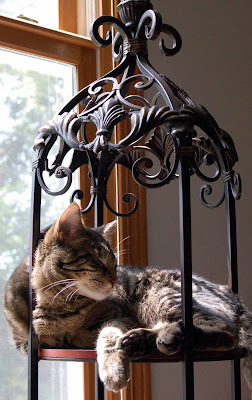 This is one of his favorite perches. So far this summer I've been taking a bit of a break from painting. I've gotten a few things done, but now I'm starting to gain momentum again. I'm going to try to take a fibers class this semester, so I'm working on research and ideas for some new projects. This is a sneak peak of what I'm working on, more to come later. The yarns look great- and your cat is the cutest! Look at you Miss Resourceful! 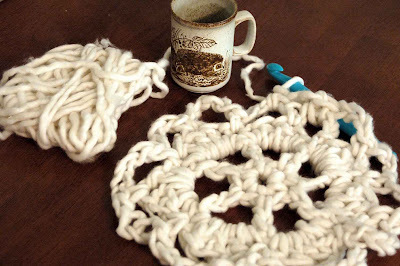 Recycling that yarn is a great idea!